KATHMANDU, Oct 30 : Mr. Nawaraj Dahal has been elected the president of Trekking Agencies Association of Nepal (TAAN). Dahal, a candidate for the post of president from the leftist alliance, was elected from the 39th annual general meeting of TAAN held on Sunday. He secured 331 votes to clinch the TAAN presidency as against the 313 votes polled by his closest contender Mohan Lamsal from the Democratic Panel. Independent candidate Nuru Jambu Sherpa secured 50 votes in the election held for the post of TAAN president, according to the TAAN election committee. Similarly, Khum Bahadur Subedi has been elected the senior vice-president, Jeevan Thapa Magar the first vice-president, Neel Hari Bastola the second vice-president, Aang Pemba Sherpa the general secretary, Sujan Lamichhane the secretary, Ram Krishna Timilsina the treasurer and Tara Rana the joint treasurer of TAAN. The newly-elected working committee members include Ritu Gyamden, Rabindra Adhikari, Rajan Prasad Kapri, Gopal Shrestha, Jeevan Lama, Bbauram Gurung, Suk Bahadur Lama, Sher Bahadur Pariyar and Janga Bahadur Lama. 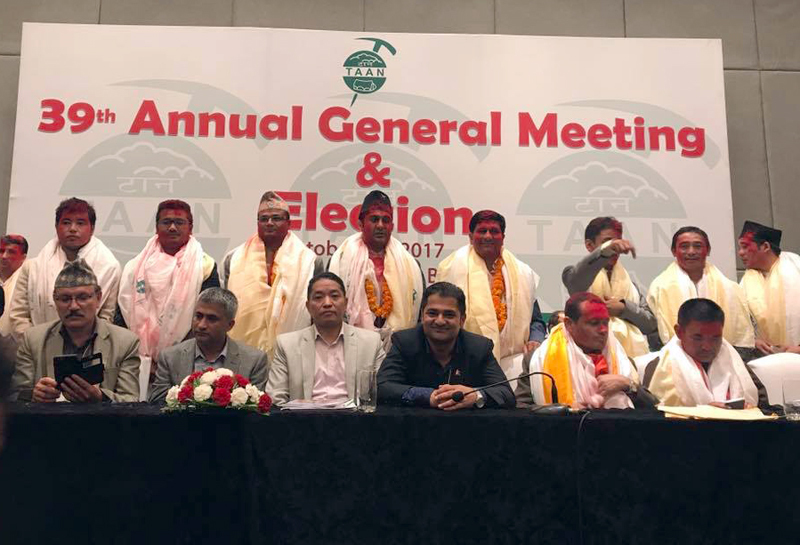 The newly-elected TAAN president Dahal, speaking after his election, said his priority would be to work together with all the trekking agency entrepreneurs for further raising the TAAN's professional image. Dahal, who is also the Nepali Consul for the Republic of Estonia, is also the coordinator of Nepal Tourism Entrepreneurs Organization.